Ride with us, on Ocean City’s municipal buses that travel along Coastal Highway. Our buses are safe, clean, reliable, and convenient. A $3 Ride-All-Day pass allows you to ride from 6:00 a.m. until 6:00 a.m. the next morning. Our friendly and knowledgeable drivers will be glad to take you down to our South Division Street Transit Center or to the North end Transit Center or anywhere in-between. Don’t forget, with your $3 pass, you can transfer to one of our Park & Ride buses at no additional cost and go to our beautiful West Ocean City Park & Ride facility. 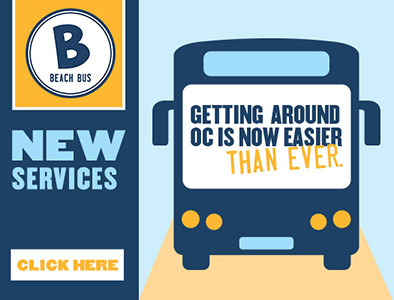 Please review the Park n Ride “Beach Bus” section for additional information regarding its operating schedule. The Park & Ride Facility is also a connection point for Shore Transit. All Ocean City buses are handicap accessible. If a vehicle lift/ramp and securement area can accommodate a mobility device Ocean City Transportation will transport the device (and user). COASTAL HIGHWAY BEACH BUSES – South Division Street Transit Station to/from 144th Street Transit Station. Standard Fare: $3 Ride-All-Day. Exact cash fare required, use of EMoney or use of pre-paid photo ID General Bus Pass obtained from City Hall. Half Fare ($1.50 Ride-All-Day): Senior Citizens age 65 and over, Disabled Persons, Medicare card holders and Ocean City Non-Resident Senior Bus Pass holders. Proof of eligibility may be required. Exact cash fare required, or use of pre-paid photo ID General Bus Pass obtained from City Hall. Free: Children 42 inches in height and under, ADA Certified Disabled card holders and Ocean City Resident Senior Bus Pass holders. Proof of eligibility may be required. Mission StatementIn a friendly manner and with safety as our primary goal, we are committed together to provide an efficient public transportation system to the residents and vacationers of Ocean City without incident, accident, or inconsistency.